The federal Asbestos Hazard Emergency Response Act (AHERA) requires all public and nonpublic elementary and secondary schools to be re-inspected for all known or assumed asbestos-containing building materials (ACBM), friable and non-friable, in all facilities which are owned, leased, or otherwise used as a school building every three years. The 2019 triennial re-inspection must be completed no later than July 8, 2019. If a school was built after October 12, 1988, the architect or engineer responsible for its construction must sign a statement that “no ACBM were specified as building materials in any construction document for the building, or to the best of his/her knowledge, no ACBM was used as a building material in the building.” If an existing building that is to be used as a school building, is leased or acquired on or after October 12, 1988, it must be inspected for ACBM prior to its use as a school building if no such statement is available. In the event it is necessary to use a building that has not been inspected for ACBM, the building must be inspected for ACBM within 30 days after the start of such use. The re-inspection process may only be performed by a person certified by the State Department of Labor (DOL) as an asbestos inspector. The re-inspection does not require a new AHERA management plan, however, it does require a new section in the existing plan that reflects the 2019 re-inspection. This new section must be developed by a person certified by DOL as an asbestos management planner. The overall AHERA re-inspection process is the ultimate responsibility of the school's asbestos designee. Guidance for the designee is available here. In conjunction with the AHERA triennial re-inspection, all New York State public school districts (including BOCES and charter schools) must complete and submit a 2019 AHERA Triennial Report to the Commissioner of Education no later than September 1, 2019. For further information and assistance on AHERA, contact your BOCES Health and Safety Office, Facilities Planning at 518.474.3906 or see https://www.epa.gov/asbestos/school-buildings#requirements. The NYSSFA Southeastern Chapter and the Lower Hudson Association of School Business Officials (LHASBO) held their second joint meeting on Friday, March 29. The topic of discussion was capital project construction. A panel of experts consisting of an architect, construction manager, bond counsel, fiscal advisor and legal counsel discussed key points in the development, design, construction, legalities and funding that go into a capital project. In attendance were approximately 44 DOFs, business officials and superintendents as well as NYSSFA President Paul Rooney. Both the Southeastern Chapter and LHASBO Executive Boards plan to meet in May to discuss next year's joint meeting dates and topics. The Whitesboro Central School District is being recognized for initiatives it has taken to keep students and staff safe. 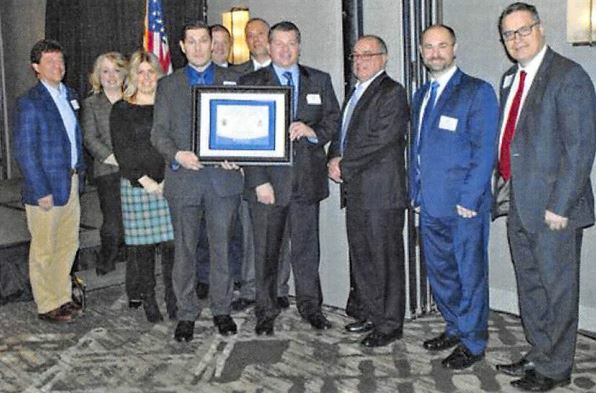 At Utica National's School Risk Management Seminar in Syracuse on March 19, Whitesboro CSD was one of several schools awarded through the Utica National 2019 School Safety Excellence Award Program. Whitesboro was one of 13 local school districts and BOCES organizations awarded Titanium with Honors. Of the local districts recognized in the Titanium category for school safety initiatives, Whitesboro CSD was the sole recipient of Special Recognition due to the District's efforts addressing safety measures such as student and staff training, building access control, lockdown procedures and devices (blue lights, door hardening and lockdown integration devices/protocols) and community training initiatives. Accepting the award on behalf of the District were Whitesboro Board of Education President Michael Head, Assistant Superintendent for Business Joseph Muller, Assistant Superintendent for Learning and Accountability David Russo, Middle School Campus Principal John Egresits, Deerfield Elementary Principal Kelli McGowan, Director of Facilities and Maintenance Kevin Storsberg, and Director of Information and Instructional Technology Adam Cleveland. Safety and security remains a top priority within Whitesboro, and the District continues to enhance these efforts and initiatives at every opportunity. The District's proposed 2020 Capital Project includes safety and security enhancements such as cameras, doors and building access control measures, and an emergency notification system, which would further ensure the safety of all Whitesboro students and staff. Onteora school district Superintendent Victoria McLaren says she's rethinking a proposal to have some special education programs centralized at Woodstock Elementary School. McLaren said the proposal was intended to reduce costs but that the potential impact on students could change those plans. “The ... goal is to support the development of a long-term districtwide plan that strategically addresses educational goals, declining enrollment, facilities, community impact and cost savings,” she said. McLaren said special education programs are developed annually based on needs for the types of services required. She said that occasionally has led to students needing to transfer between elementary schools more than once. Niskayuna school board members cautioned families against making plans for the 2020 April school break last week as they approved next year's school calendar with a heavy dose of ambivalence. Before the board adopted the school calendar, Superintendent Cosimo Tangorra Jr. warned the calendar did not include any “snow days built in” and that even just one snow day over the winter would force district officials to bring students to class over the April recess. The Oswego County Anti-Bullying Coalition recently held a forum at CiTi BOCES in Mexico to meet with students from all nine school districts in the county. More than 50 volunteers participated in the conversation to identify issues and underlying problems associated with the effectiveness of incident reporting as well as the level of involvement of school officials and outside agencies in resolving them. For confidentiality, none of the students’ names were collected. Representatives from New Justice Conflict Resolution Services, Inc. of Oswego administered student surveys and moderated the forum. Students were organized into focus groups in which they completed anonymous individual surveys. The results were then collected and reported back. Students were asked questions about what makes them feel unsafe and where these situations arose. They were also asked to whom they turned for help and what steps were taken to mediate the occurrence. Finally, they had a chance to offer their own ideas and suggestions for additional actions they thought might be helpful. A group of states, led by New York, are suing the Trump administration over changes to school lunch nutrition standards. Six states and the District of Columbia charge President Trump’s Department of Agriculture weakened nutritional standards in school breakfasts and lunches when it relaxed the requirements limiting salt and refined grains in 2018. The plaintiffs in the suit, which was filed in Manhattan federal court and also names Department of Agriculture Sonny Purdue as a defendant, argue the changes to school breakfast and lunch standards were executed without required public input and in violation of nutrition requirements previously established by Congress. New York State Attorney General Letitia James announced the litigation with a press conference at Public School 67 in Brooklyn.